The Samsung SCB-6000 is a box HD CCTV camera that features a 1/3" progressive scan CMOS sensor and captures full HD images at 30 fps for the high-quality videos of surveillance area. This camera is equipped with IR-cut filter that prevent the IR light from distorting the colors of the images. Privacy masking allows you to exclude certain spaces within a selected area from triggering motion-based recordings, thus saving storage space. The high-resolution camera with Day/Night ICR function switches between color and B&W as per changes in ambient lighting, ensuring accurate color reproduction in daylight and enhanced B&W images at night. With dynamic noise reduction functionality, it switches on to record videos with minimal blur. Dual power capability adds to your convenience by allowing you to use this camera at multiple sites, which might either have a 12 or 24 V power supply. The Samsung SCB-6000 has many exciting features for users of all types. 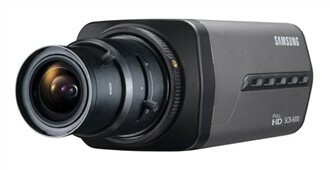 See the Samsung SCB-6000 gallery images above for more product views. The Samsung SCB-6000 is sold as a Brand New Unopened Item.